Ted Bundy, the notorious serial killer, died and was greeted at the gates of hell by the Devil. The Devil told Bundy that he must choose between three hells, and the decision, once made, was final. The first hell was very hot and was filled with people standing on their heads on satin pillows. Bundy saw this and thought this would be horrible – he’d have headaches all the time. “No, I don’t think I like this one,” he said. This joke is a long way around to this month’s topic for the Access Wizard: the Choose function. The Choose function is a way of taking a numeric value and turning it into virtually anything you want – hopefully something a little bit better than the fate that Bundy encountered in hell. The Choose function is fairly straightforward. It takes in a numeric argument, one, two, three, etc., and translates that number into whatever you would like it to be. Or we might say that the runner in a race that comes into position number one should get a gold prize, the second place finisher should get a silver prize, etc. With the choose function, it is not hard. It takes the form Choose (position, value1, value2, ... value n) where position is a whole positive number. It returns the value in the ordinal position corresponding to the position argument. This becomes clearer with an example. I have a table in my database that is nothing but a series of numbers 1, 2, 3, 4, 5, etc. 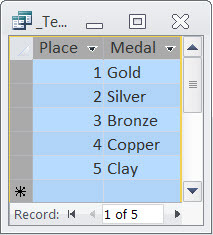 Consider these to be places that somebody might finish in a race and we want to translate the finishing spot into the medal that they might receive. In a new query, I paste the SQL below. (Note If you’re not sure how to paste SQL into a query, take a look at June 2005 Wizard. Note that our code up above starts with my field “counter” and that number is translated into gold if it is one, silver if it is two, etc. It is as simple as that. Although you might not use this function frequently, it is something that you will want to have in your toolbox when the need comes about. This month, we investigated the Choose function, which allows you to take a numeric value and easily translate it into whatever you want. The limitation of this Choose function is that it must start off with a number. There is a companion function, called the Switch Function, that does not require a number to choose, but rather will switch anything to anything else. The Switch Function is detailed in the October 2007 Wizard.